Grilling filet mignon is relatively simple when you learn a few tricks of the trade. It is not difficult to learn how to BBQ Filet Mignon, and even a completely novice griller can make this tender and juicy steak with relative ease when they follow the steps below. Filet Mignon is one of the most tender cuts of steak, which makes it outstanding for anyone who enjoys being able to cut their meat with a fork. (Really, you don’t even need a knife to cut through perfectly cooked filets!) It is a slightly more expensive cut of beef and many people are nervous that if they try to cook it, they will burn it or otherwise ruin it. However, it is no different really that grilling any other food you learn how to BBQ, so if it is your favorite type then have no fear! You WILL cook it perfectly if you listen to us! Getting your grill prepared will depend greatly on whether you will be using charcoal or gas. If you are grilling on a gas grill, then you will want to crank it up as hot as it can safely go. Some people recommend lightly coating the grate with cooking oil to prevent sticking, but if you are very watchful you will likely be able to make a great tasting meal even without it. Preparing the meat takes very little to do, since you really only need salt and pepper to taste, though many people enjoy using marinades or other seasonings as well. There are a variety of marinated steak recipes that may be of interest to try. The only other preparation needed depends on what temperature and doneness you would like the filet to be cooked to. A medium rare or medium steak does not need any additional preparation. However, if you like your filet medium well or medium, you may want to consider a technique called butterflying that will allow you to cook the center through without worrying about excessive burning or charred ends. To butterfly a steak, you will simply want to cut the steak lengthwise in half. (So that when you pull it apart you have a “butterfly” type shape with each half being a wing of the butterfly). This will make the meat much thinner and reduce the cooking time and the risk of burning it. If you like yours rare or medium rare however, don’t butterfly it – or it will be cooked way more than you like it! Once you grill is prepared and as hot as it can get, you can go ahead and place them on the grate. You should hear a sizzle sound while it is cooking – if you don’t hear that sizzle, take the cuts off and let it get hotter before proceeding. Most filets will take about 3-5 minutes on each side. A medium rare to medium steak will be done in about 7-10 minutes and only need flipped once. A medium well steak will need to be flipped twice in order to make sure that the outside does not burn but the inside cooks fully. Our gas grilling steak tips has some additional information that may be useful for helping you know when the steak is done and how long you should cook the filet mignon. 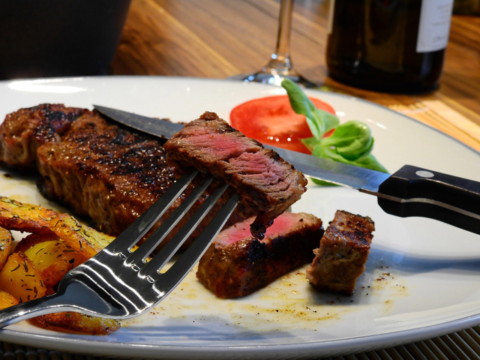 Be sure you use tongs when flipping the steaks, as if you poke it with a fork it will lose a lot of its juiciness and flavor. Checking with a meat thermometer can help you take out the guesswork in deciding if you have cooked the steak long enough. When finished, serve up with your favorite side dishes, sauces, and other favorites. Have any additional tips on how to BBQ and grilling filet mignon? Share them in the comments below. Pingback: What is the Best Way to Marinate Steak?